Microchips help ensure your pet’s safe return home if he or she is lost and provide you with peace of mind. Pet identification is especially important in New York City. A pet microchip is a tiny electronic device, about the size and shape of a grain of rice, that contains unique information about your pet. It is implanted beneath a pet’s skin between the shoulder blades, and stays there for the pet’s entire life. This procedure is as easy and as painless as a vaccination. Each pet microchip has a unique number. This number, along with information about the you and your pet, is added to a national pet registry. Most veterinary hospitals and animal shelters have electronic scanners for detecting and reading these implanted microchips. If your pet is lost, his or her microchip can be scanned, and the information used to reunite you and your best friend. 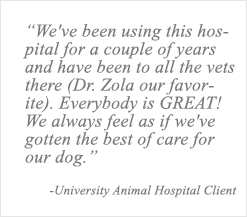 University Animal Hospital uses the Home Again microchip system. Both you and your pet benefit from our large, well-stocked pharmacy. We maintain an inventory of most veterinary pharmaceutical products. If your pet requires medication for heart disease, intestinal problems, skin disorders, or arthritis, we can fill his or her prescription quickly and easily. Our pharmacy is also stocked with the latest flea and tick treatments, heartworm preventatives, and a variety of prescription diets, all of which keep your pet in good health and prevent and control health problems. Our pharmacy is convenient for you: your pet’s prescription can be filled during your visit to University Animal Hospital. Most importantly, we stand behind the products that we sell. You can be sure that your pet receives only high-quality, medically-proven medications, and conveniently located on-site at University Animal Hospital. University Animal Hospital’s pet behavioral counseling services relieve the stress that behavior problems can cause you and your pet. Many times, behavior problems have a medical cause. Our behavioral counseling services help you recognize, validate, and categorize behavior problems in your pet. 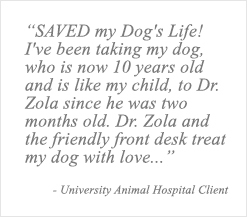 We work with you to develop a treatment plan that eliminates your pet’s behavioral problems. Nutritional counseling holds many benefits for your pet. Whether your pet needs to lose a few pounds or requires a specialty diet in order to manage a health condition, our full-service animal hospital can help. Our medical staff helps you choose the right diet for your pet, so that she or he remains happy, healthy, and active. We carry a full line of Hill’s Science and Prescription Diets as well as Iams/Eukanuba veterinary diets.